Our Patriot PBX Pedal board cables give you everything you love in our Patriot SX instrument cables in a cable designed for your pedal board. Now you can go start to finish with our best sounding cable. 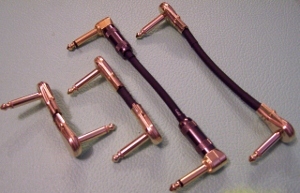 These are full-range pedal board cables made in the U.S.A. Hand built in our custom shop with either G&H Black and Gold 1/4" plugs or our all new design flat "RA" plug. This is a great sounding cable for bass players and guitar players. Our all new "RA" plugs are a gold plated flat right angle plug that we had specially designed just for us. This is a durable, well build plug designed for years of service and excellent sound quality! Here is our new exchange process for customers deciding to go with Patriot PBX pedal board cables. Our Customer desides what lengths and plug end configurations they want and places the order. We build the cables and ship them up. Here is the cool part, if you decided you need to make some adjustments you can exchange your Patriot PBX pedal board cable for a different length. All it costs you is shipping to our shop! No exchange or restocking fees. This way you get the benifits of reliable, soldered plugs with the flexibility of really customizing your cable lengths! When you add up the benifits, the cost per cable is about the same as our solderless competitors except we do the work for you!!! No more fussing with unreliable solderless plugs!